Everything you need for after dinner dessert. We included a painted ceramic top espresso pot, Scenes of Italy Espresso Cups & tray. 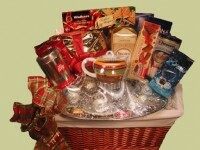 For your taste buds, Illy Espresso, Panettone Cake, Assorted cookies, Perugina Chocolates, Biscotti, Nougat and Candies. Shown her as Deluxe $250.00. Please call us to customize to any price. All our espresso pots are Stainless Steel Pots. All cups come with saucers.